A sermon preached by Rev. David M. Crawford at Rundle Memorial United Church, Banff, on October 16/11 (125th Anniversary Sunday part 2; and part of a sermon series on our stained glass windows). Based on Matthew 5:13-16. Last Sunday at about 9:45 am, thus just prior to the start of Thanksgiving Sunday worship, a tourist in the sancutary walked up to me, extended his hand and with a huge smile on his face, said: “Hello, I’m from Mylor.” He expected me to know instantly the name of the town Mylor, I could see it in his eyes. With some disappointment he persevered, “I’m a descendent of Robert Rundle”, he said. “and our tour bus leaves in ten minutes”. Quickly I told him of our 125th anniversary, of the mountain that bears his ancestor’s name, the sermon series on the windows, and then he was gone. As I went about my usual last-minute Sunday morning duties, as he departed, he could be heard singing along with Tanya as she rehearsed, “We Plow the Fields and Scatter”, both exhuberance and regret in his deep baritone voice. A missed opportunity, the timing just not right, but he assured me he’ll be checking our web site often upon his return home to Mylor, Cornwall, England. So obviously you’ve figured it out, the missionary this church is named after, that glorious mountain is named after, and even a type of rock or shale is named after, maybe even a beer is named after, was born in Mylor, 1811. By way of skipping his early years we can state that at age 29 Robert Rundle wanted to serve the church and in 1840, the Hudson’s Bay Company reached a deal with the Wesleyan Missionary Society that several Methodist missionaries would be dispatched to the western districts of Rupert’s Land (the name given to a large section of what would later become Canada). 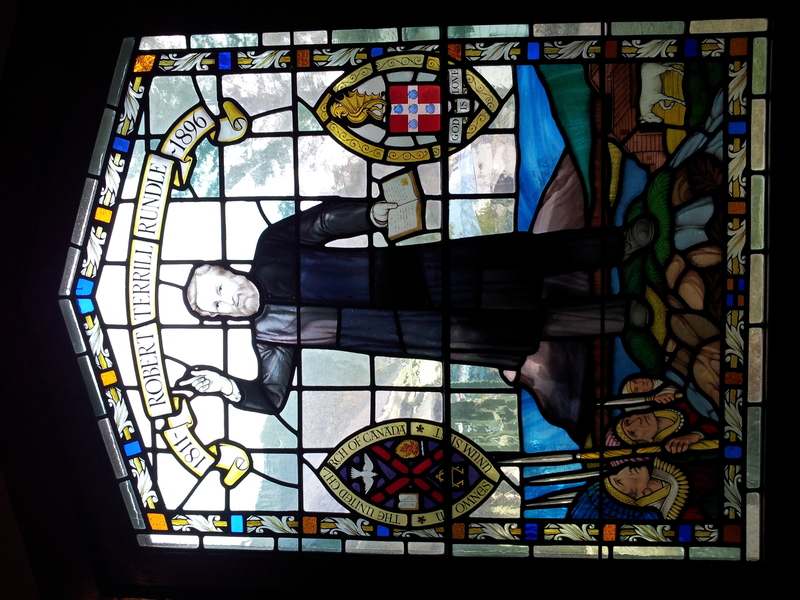 Robert Rundle was among four who were invited, and after only two months of training, he was ordained. Just over a week later on March 16, 1840, he shipped out from Liverpool. Rundle landed in New York City and travelled first northward to Montreal, then started westward on his long journey across the expanse of Rupert’s Land. He encountered first nations peoples during this travel, and quickly found that the apprehensions he had of meeting them contrasted with the delight he felt at being in their company. Eventually his relationship with and love for first nations people would deepen and grow beyond his imagining. He arrived at Fort Edmonton, the center of the Hudson’s Bay Company Saskatchewan District, in October 1840. 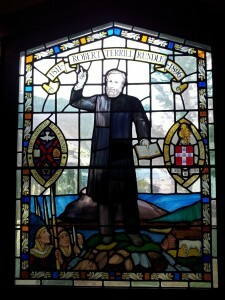 After working out of Fort Edmonton from 1840, in 1847 Robert Rundle received permission to establish a mission at Pigeon Lake, which was to be the first Protestant Mission in Western Canada and perhaps his most noted achievement as an historic Canadian figure..
His work at Pigeon Lake was effective, from a missionary perspective. In the mid-19th century Pigeon Lake was a gathering place for first nations peoples and the missionaries who worked among them. After initially focusing on the Assiniboine, Rundle turned his attention to the Cree people. He learned the language, and translated hymns and Bible passages into written and spoken Cree. Rundle grew in his devotion to these people. Rundle left Canada permanently only a year later after he established the Pigeon Lake mission, after a bad fall from his horse which seriously damaged his arm. When it did not heal properly, he decided to return home to England to seek proper medical attention, and never came back. So what was Rundle’s connection to Banff? During his mission work in Pigeon Lake, he also travelled to Rocky Mountain House and to the Bow Valley. In 1842, he wrote of the mountains, “What a spectacle to see them painted on the western sky at sunset!” Returning in 1847, he met with and held a service for a small group of aboriginals in, “a small plain…quiet in among the mountains…The scenery is most magnificent.” It is thought that this was in the Whiskey Creek Meadows area near Banff. “You are the salt of the earth”, says Jesus to disciples of all times and places, “you are the light of the world”. Clearly we as a culture and as a Christian culture hold somewhat different viewpoints on missionary activity in our own time. Yet Robert Rundle and those of his generation felt genuinely called to heed the words of Jesus from Matthew and to be as salt to a world lacking seasoning, to be as light to a world if not stuck wandering in the dimness of dusk, then wholeheartedly immersed in darkness. With evangelical fervor and a passion to improve the world, expand the reign or kingdom of God, let grace and peace, justice and freedom thrive, Robert Rundle, and Astor Schrag, and Agnus Robertson and their like ventured forth into places unknown with a mission, a purpose, a vision. Granted today, in our mainline, secular sensitivities, we shy away from words like evangelism, maybe even fervor. Yet what is our mission, our purpose, the vision of what sort of world we’re committed to seeking? In the church we still embrace a notion of “call”, that we as a people of God are a called people, that we as individuals can lived called lives, purposed lives, dedicated-to-God lives. What if we were to truly personalize Jesus‘ empowering words, to take them into ourselves, our church at a deep level – you Rundle Memorial are the salt of the earth, you the light of the world; you Ian, Karen, Anne, … are the light of the world! What might that do for our sense of mission, our desire to create something new with God here at Rundle? “And on this path the gates of holiness are open wide”, sang the choir a few moments ago. What path will we discern, with the Spirit’s help, in the months and years ahead? How might Rev. Robert Rundle’s legacy and example push us forward? The gates are open wide! May God lead us and may we be open to God’s leading here in the Valley, we – Rundle Memorial United Church! Thank you ever so much for the message on gospel of Matthew. It reflects the vision and mission of Rev. R. Rundle. I had been to Banff area last 2011 and while praying in my room at Hidden Valley Resort. I was startled to flashback missions in Canada my window faced up to Rockies and was so surprised of the story about Mount Rundle. I am a 4th generation Methodist from the Philippines and just happen that my great, great grand father was one of the 50 first converts to the Methodist Episcopal Mission and eventual became a minister of the gospel. My next visit to Canada will be more amazing and make sure to worship at Rundle Memorial Church. God bless your ministry. God bless your Church. Glad you enjoyed the message Irma. We look forward to seeing you at Rundle Next time you’re in Banff.